Harry Potter may have battled boggarts and bested a basilisk, but last week I did the Boy Who Lived one better by surviving my third Wizarding World grand opening. 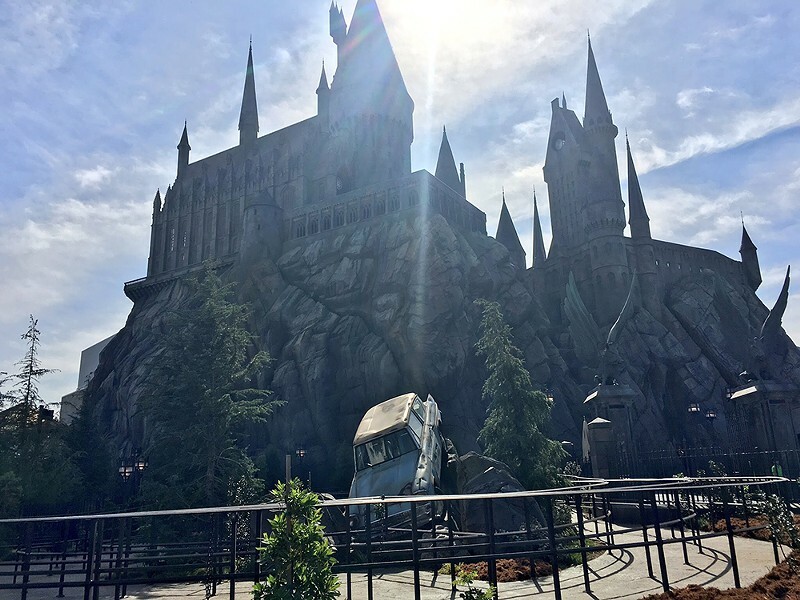 Following Universal Orlando's record-breaking debuts of Hogsmeade in 2010 and Diagon Alley in 2014, Universal Studios Hollywood became the latest theme park to sport a J.K. Rowling-approved attraction on April 7, and once again I was on hand to experience the premiere. My Muggle madness marathon began last Tuesday with a star-studded red-carpet VIP party worthy of a Hollywood blockbuster. Steven Spielberg breezed past me without stopping to chat, but Talking Dead's Chris Hardwick assured me that a magic wand would "take out Negan's bat in a second!" 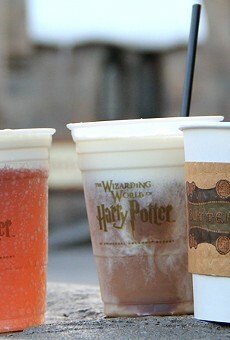 As guests guzzled free-flowing booze and Butterbeer, legendary composer John Williams conducted the Los Angeles Philharmonic playing his Potter film score while stunning projection mapping magically brought Hogwarts Castle to life; even without the orchestra, Universal could easily charge guests big money for this kind of spectacle. Wednesday was taken up by media interviews with Potter film stars and Universal executives, along with a once-in-a-lifetime opportunity to explore the new land absent any ordinary guests. Actors Warwick Davis (Professor Flitwick), Tom Felton (Draco Malfoy), and James and Oliver Phelps (Fred and George Weasley) repeated many of the same anecdotes they've shared at past Orlando events, but Evanna Lynch (Luna Lovegood) demonstrated once again why she's my favorite unguarded interview subject, bluntly opining that "there's more progress to be made" with Universal's vegan-unfriendly menus. I still shudder at memories of the original Hogsmeade's opening, when ginormous queues circumnavigated CityWalk and I-4 traffic backed up for miles. But a combination of factors – an ungodly early 6:30 a.m. opening hour, blackouts for annual passholders, announcements that the park was sold out in advance and some authentically English rain – made Thursday's debut unexpectedly docile. Though hundreds of hard-core fans huddled overnight outside the park, barely 6,000 guests shuffled into the Wizarding World during its opening hour, and by late afternoon waits for the rides were remarkably brief. 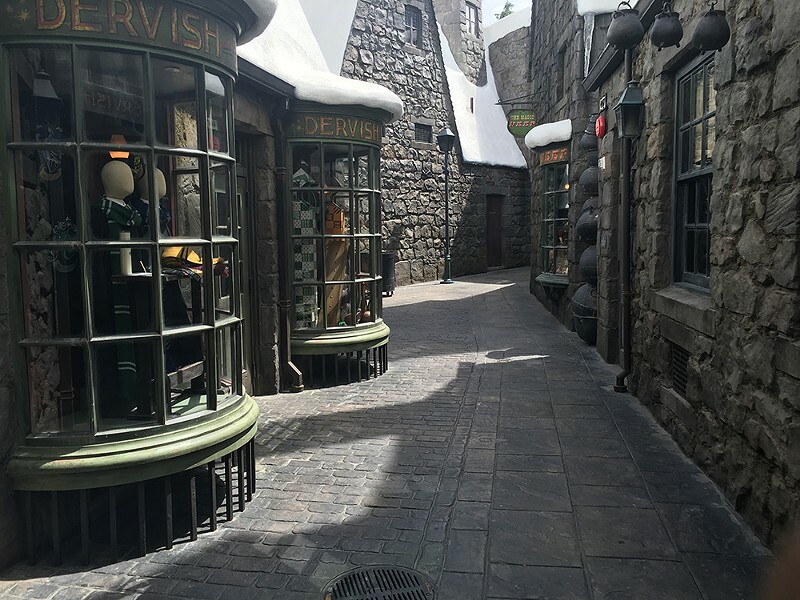 Now that the confetti has been cleared away, how does Hollywood's Harry Potter land compare to the original in Orlando? Sorry, Floridians, but California's crushes ours in ways both subtle and significant. Under superficial observation, it looks like a clone, but adjustments and enhancements are found throughout, starting with the shifting of shops to create a bit of much-needed breathing room. Gladrags Wizardwear is now an actual clothing store, instead of a false facade, and Wiseacres Wizarding Equipment has been imported from Diagon Alley. Ollivanders Wand Shop has relocated across the street and doubled in size, making it that much easier to buy your $48 wand for triggering the new and improved interactive windows hidden among the storefronts. Orlando's Dragon Challenge roller coaster is entirely absent. 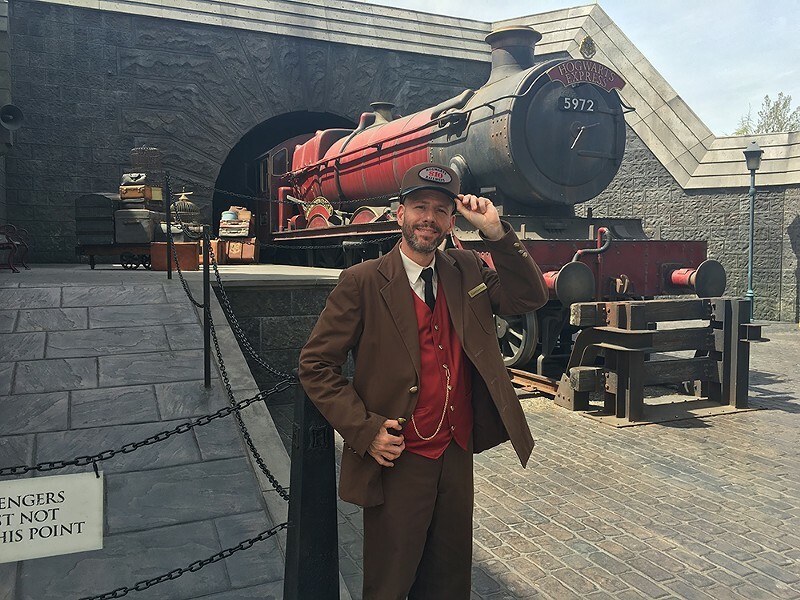 An extra-cost Hogwarts Express photo-op is where the ride's lockers would be, and a dead-end door – leading directly to the rumored future home of Hollywood's Diagon Alley – sits where Florida's attraction entrance is. The Flight of the Hippogriff kiddie coaster is a new Mack-made model rather than an aging Vekoma, providing a smoother, snappier ride. Even the Three Broomsticks restaurant was modestly improved with some dishes from Orlando's Leaky Cauldron, though the ambrosial hot Butterbeer isn't yet on their menu. Aesthetically, the biggest difference between the two Hogsmeades is in their approach to immersiveness. 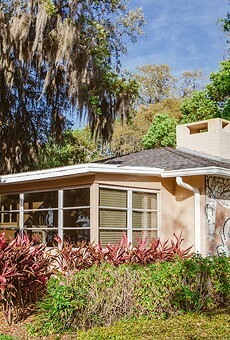 Orlando's land is famously isolated from the rest of the park, preserving the visual illusion of entering another world. Due to its constrained geography in a dense urban environment, Hollywood's version doesn't have the same luxury, and it's admittedly odd to see office buildings and the lights of Los Angeles intruding on some sightlines. But supervising art director Alan Gilmore outdid himself compensating for the compromised views, extending rockwork on buildings that were left exposed in Orlando and slightly reorienting Hogwarts Castle so that the distant mountains substitute as the Scottish Highlands, creating unparalleled vistas from the peak of Hippogriff's lift hill. Gilmore told me he even adapted his palette to the "high-definition" California sunlight, which doesn't dull colors over distance the way Florida's does, and added additional layers of dirt, grime and texture in every corner. Ironically, the only altered element of Hollywood's attraction that I didn't feel was an unambiguous improvement is the one that's been most intensively advertised. The signature Forbidden Journey dark ride received a host of upgrades, from streamlined locker access and an Express queue option to more dynamic lighting and audio effects and expanded sets in the already-impressive Forbidden Forest and Chamber of Secrets scenes. Best of all, the skeletal Dementors are more numerous and detailed than before, reinstating several animatronics supposedly deemed too scary for Orlando's audience. But unfortunately, the hyped conversion of the ride's filmed sequences to 3-D is a mixed bag at best. The glasses, styled after Quidditch safety goggles, allow distracting light to leak in around their periphery, and though some objects (like the Golden Snitch) seem to come convincingly close to riders, the projections appeared oversaturated and unfocused, possibly making it more puke-inducing than Orlando's original, despite less aggressive motion from the "floating bench" ride vehicles. Thankfully, Universal Creative president Mark Woodbury said they have no immediate plans to bring the 3-D to Florida. For now, Potter devotees will have to apparate westward to decide for themselves which Wizarding World is the best.